BOO! 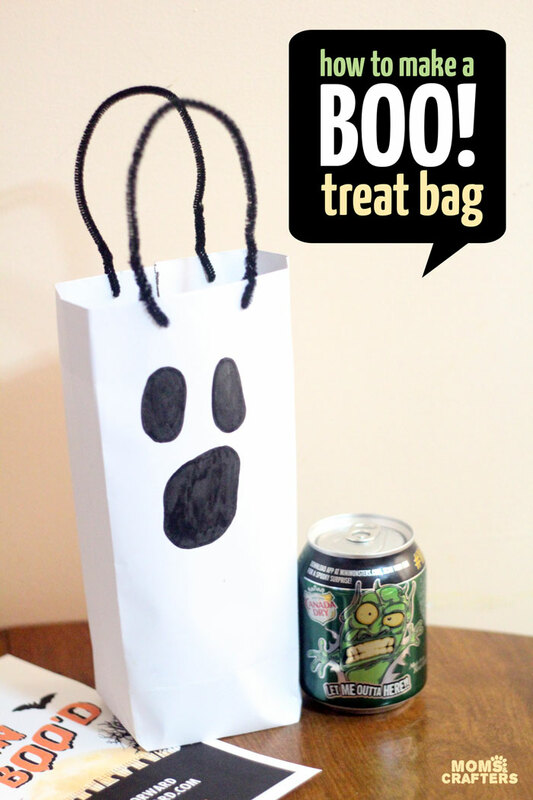 a friend with this spooky ghost treat bag that’s made using supplies you likely have handy! This post was originally sponsored by Mars Chocolate. 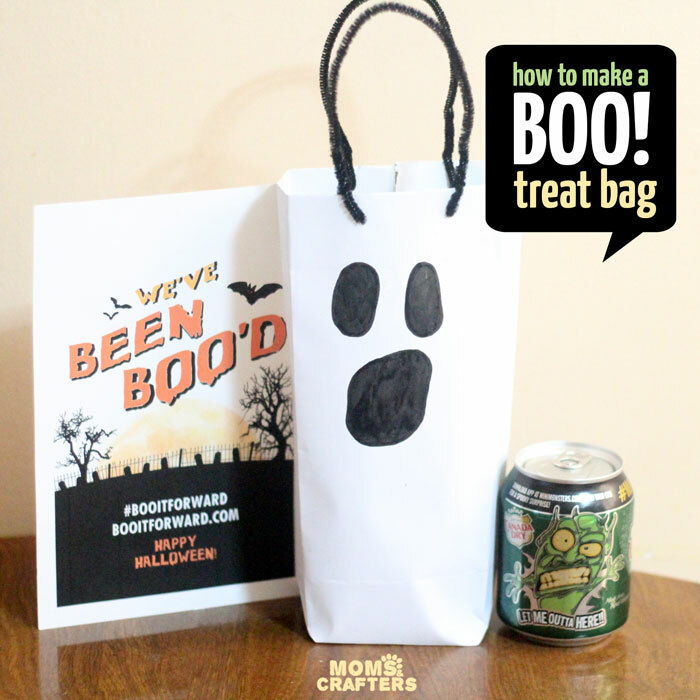 Make a super easy ghost treat bag, print the BOO! sign and card. 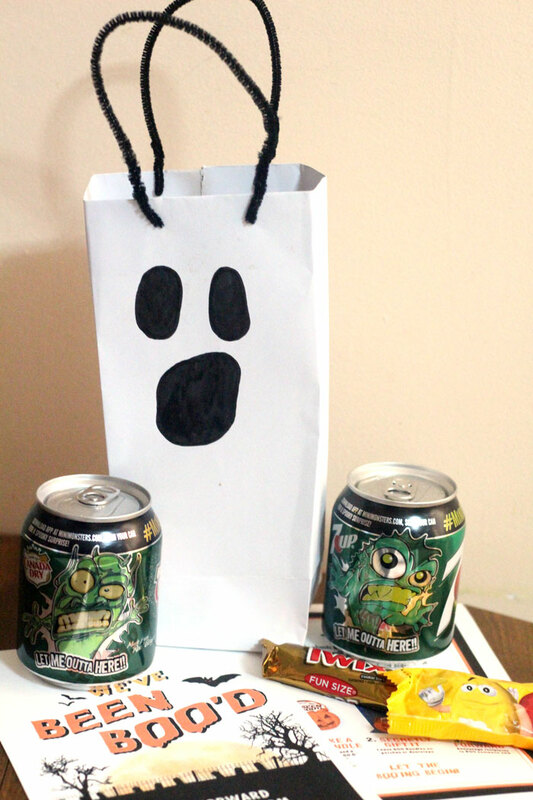 Assemble your cards, and place it in your bags along with some favorite fun size chocolates, and mini monster soda cans (available seasonally). Head over here and print the card and sign! For my bag you’ll either need to fold the card in half, or you can print it at 50% of the size (page 2 only). 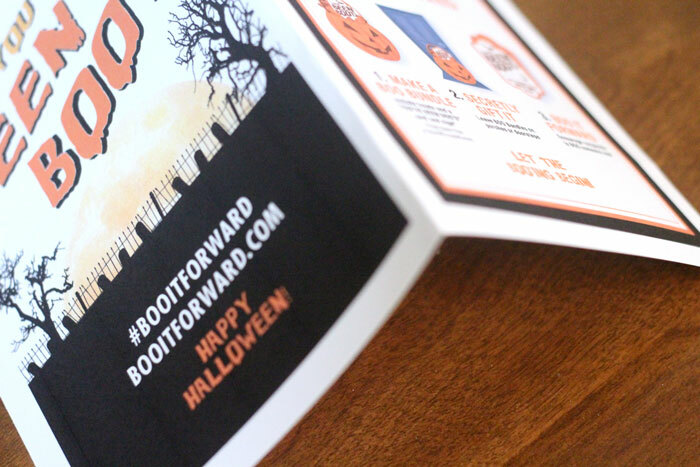 On the first page, you have a “we’ve been BOO’d” sign and instructions. 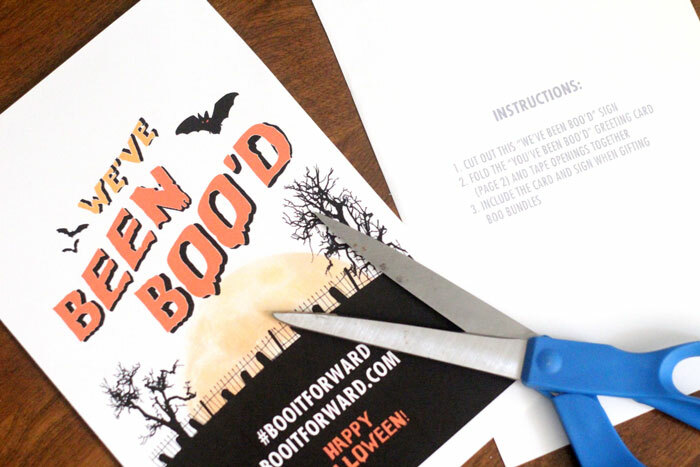 Cut the paper in half, and hang the BOO sign in your window or with your Halloween decor. 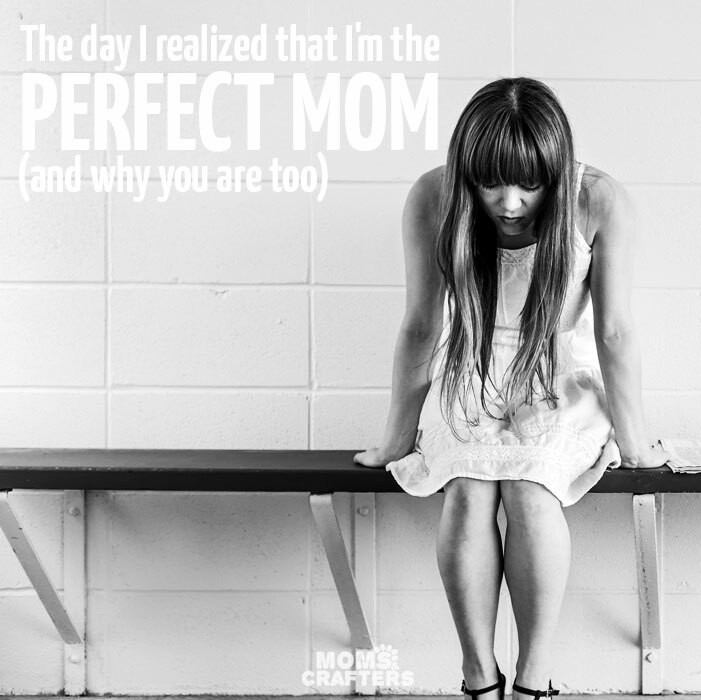 On the second page, you have the “you’ve been BOO’d” card. Fold it in half, so that the printed signs face outward. Tape shut the open sides to form a card. To really properly BOO someone, you obviously need a spooky white ghost. 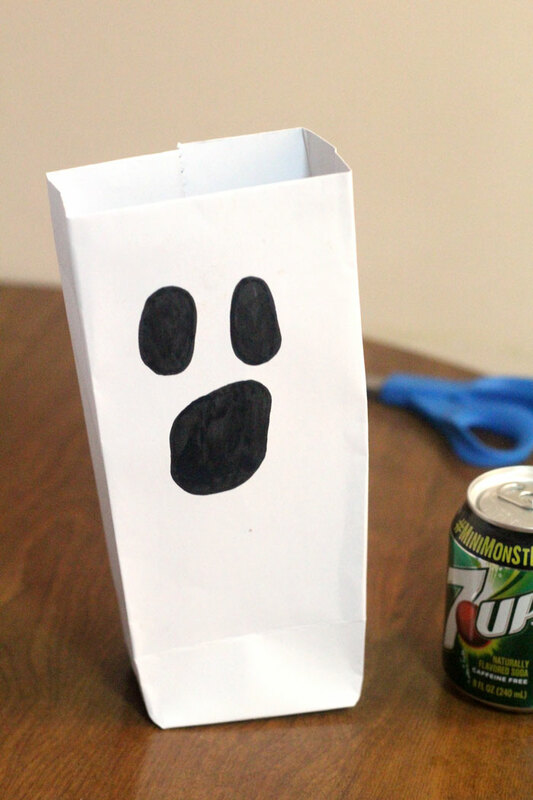 This ghost treat bag is so easy to make. 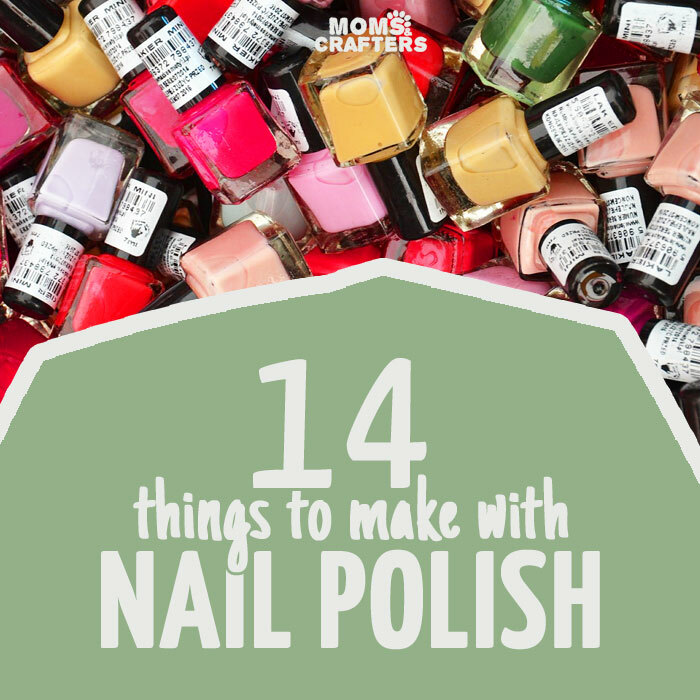 It uses supplies you have available and the more you make the better at it you’ll get. 12 x 12 inch white paper. I used the back of a scrapbook paper. That makes for a nice print on the inside. 1. Place your scrapbook paper printed side up. Fold down the top inch or so of your paper down. Fold the two sides toward the center. Next fold up the bottom. How much you fold will determine the size of the base of your bag. 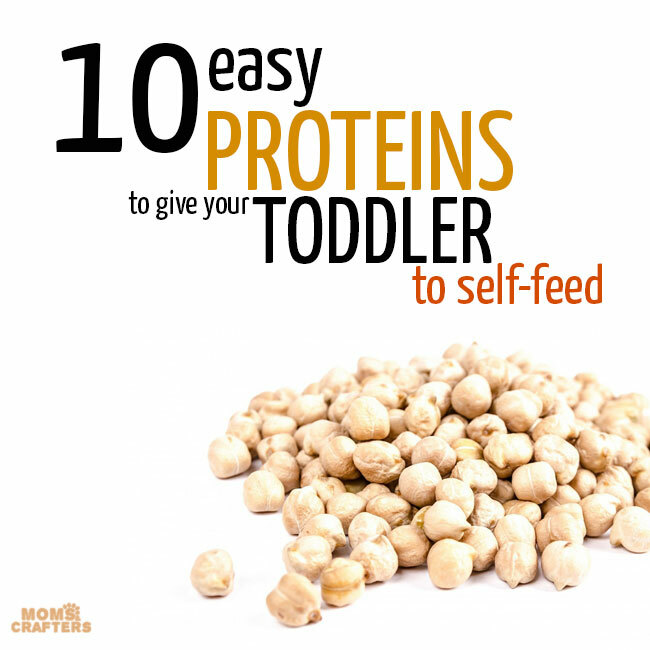 Use your treats to measure how big you need it. 2. Unfold your paper. You now have markings that show you where the front of the bag will be. On the white side, within the crease marks, draw your ghost. 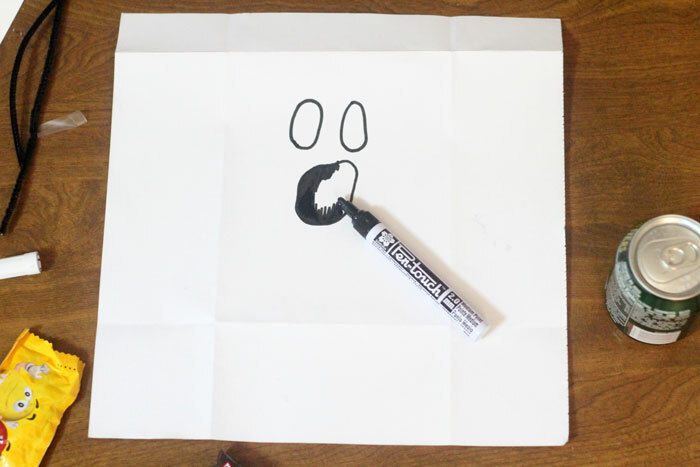 Draw irregular ovals for eyes, and a larger more irregular one for the mouth. 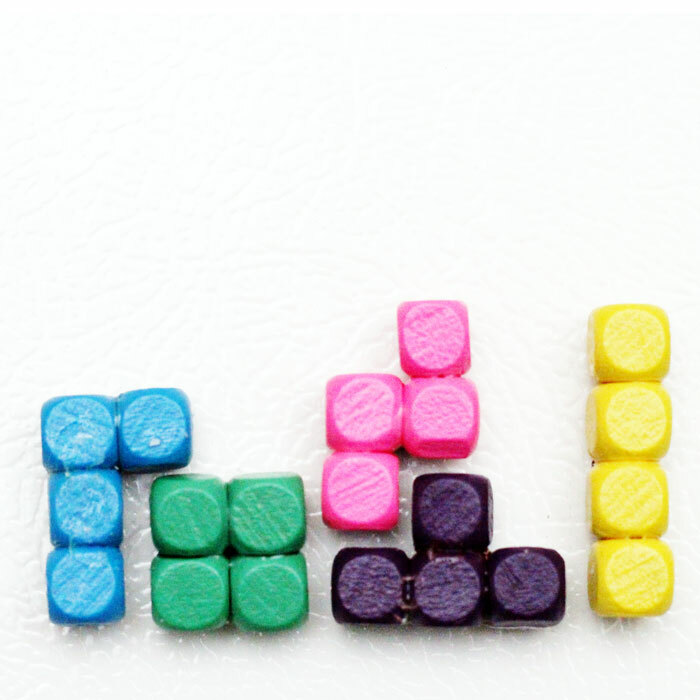 Color them in. 3. Fold the top back down, and the sides back in. Tape the two sides together, and fold your bottom back up. You should now be where you were at the end of step 1, except with your center taped in place. Split apart your bottom flap and fold it as pictured in the center photo. Fold down the top and bottom corners so that they meet in the center and tape them in place. 4. Open up your bag. You can crease the sides too if you’d like. I did that a bit unevenly to resemble a ghost more. 5. 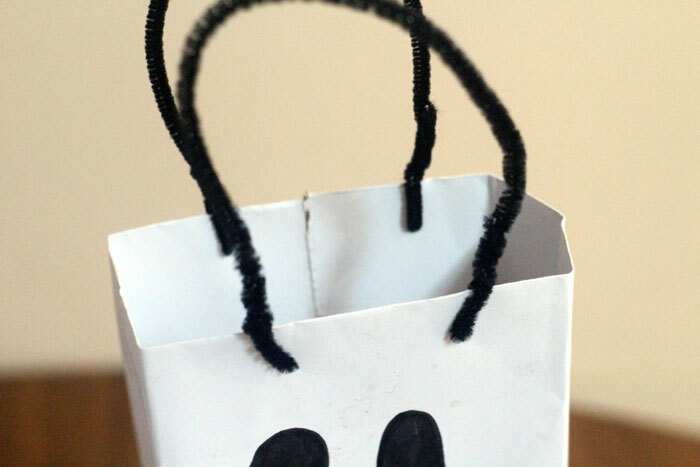 Poke your chenille stems into the reinforced top to form two handles. You can make a hole with a hole punch first if you want. 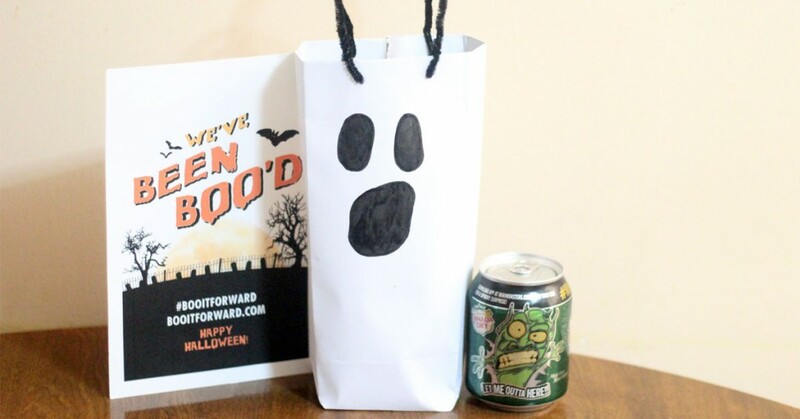 Fill your ghost treat bag and BOO someone! 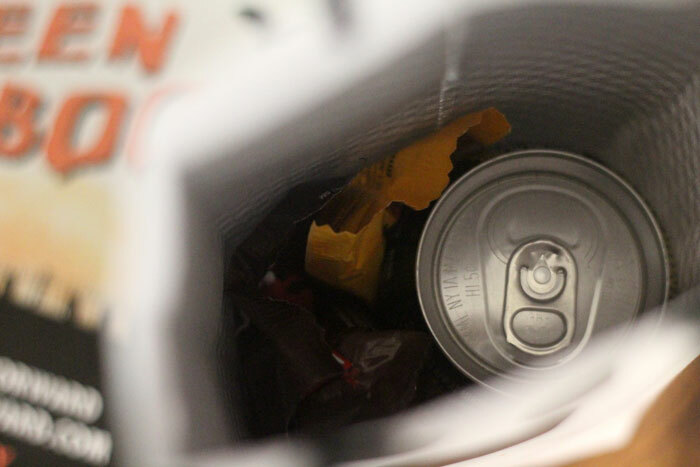 BOO someone – and listen for your doorbell, you might just get BOO’d back! What ideas do you have for BOO kits? What other special things are you doing for Halloween? Autumn crafts, Crafts for kids, Free Printables, Holiday and Seasonal crafts, More printables, sponsored. Bookmark.